Some free pixel art assets for various controllers/gamepads: PS4, Switch Joy-Con, Switch Pro Controller, XBox 1, XBox 360, as well as some other extras included for fun! Useful if you need pixel art icons for common gamepad buttons in your game UI. 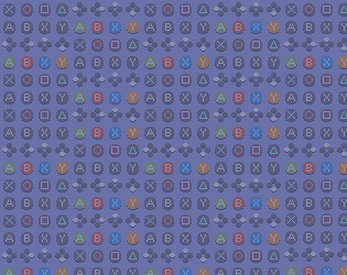 All assets are aligned to a 16x16 grid, but some wider buttons (such as Option/Share/Start/Select/etc) are 32x16 assets to accommodate the text label. You're free to use these in both free and commercial games. You're also allowed to modify the assets you see fit. Just credit me, Andrew G. Crowell (eggboycolor) if you use these assets or make modifications. Provided as-is, there are possibly errors/mistakes. There may be inconsistencies with official console guidelines for specific controller button assets. Hopefully any issues can be addressed as they're reported, but there's no guarantee/warranty. For comments or feedback, leave on this project page, or contact @eggboycolor on Twitter. Thanks! Hope someone finds this handy.